The peach oatmeal crisp dish combines the best of everything. Delicious to taste and healthy for the body, there is nothing that can get better than this age-old recipe. 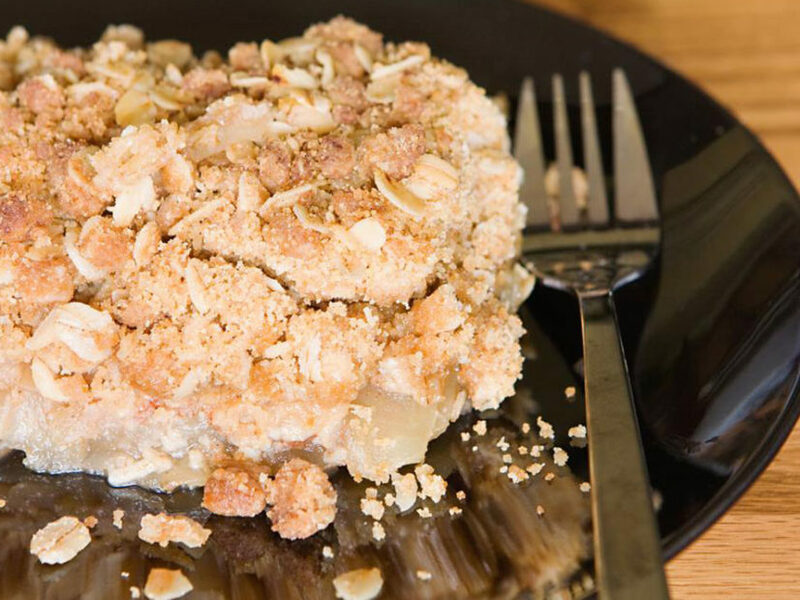 This dish is primarily prepared from fresh peaches and crisp oats, sounds like a great combination right? The peach oatmeal crisp recipe is not only a good breakfast meal but can be eaten at any time of the day. What’s more? It comes with loads of health benefits. From aiding in weight loss to effectively regulating the bowel movement, it also keeps you full for long hours. So are you tempted to have some of this amazing dish? Easy to prepare, here is the best peach oatmeal crisp recipe to try. A little effort and lots of love, look how tasty your peach oatmeal crisp recipe turns out to be. Step 1 – Slice one pound of peaches into thick wedges. One peach can be sliced into 4-5 pieces, depending on the size. Keep the fruit pieces aside. Step 2 – Preheat the oven rack to 400 degrees F.
Step 3 – Place the peach wedges in a small bowl. Add in 2 tablespoons of granulated sugar and mix. Now put in 1 tablespoon of all-purpose flour and a pinch of nutmeg powder. If you are one who can never get enough of lemons and love the fresh flavor, add a teaspoon of freshly grated lemon zest. Do note that this is optional, but it brings a nice twist to the traditional peach oatmeal crisp recipe. Step 4 – This is the step that makes for the topping. Place a saucepan on the heat. Take two tablespoons of unsalted butter. You can choose to use salted butter too. Let the butter melt. Now add two tablespoons of olive oil. Once the oil and butter are heated, add in two tablespoons of granulated sugar and brown sugar each. Stir this mixture well, until the sugar completely melts. Now add two tablespoons of all-purpose flour, two tablespoons of wheat flour, half cup of oatmeal and a pinch of cinnamon. Let the ingredients blend well. Sprinkle a pinch of salt and sliced almonds. Step 5 – Press the fruit mixture into a baking tray. Transfer the oatmeal mixture evenly on the top of the fruit. Bake the dish for 20-25 minutes until the top comes out in a light golden color. Now dig in! If you wish to add a little twist, scoop up some ice-cream or drop a dollop of cream on your slice of peach oatmeal crisp. The peach oatmeal crisp recipe can be served warm, as well as cold. It tastes great either way. The best part, you can prepare it on a day that you are free and consume it through the week. Yes, it says as fresh for a while.